Social action contact Fred Green Social Action Chair. PH supplies volunteers who work Tuesday nights at the Ralph Reeder Food Shelf in New Brighton. See the Food Shelf page for more information. Pilgrim House participates in the Walk a Mile for Our Neighbors fundraiser supporting the Community Support Center (CSC) held in July at Silver View Park in Mounds View. Pilgrim House has also supported the winter Sing for Your Neighbors CSC fundraiser. CSC helps people in danger of eviction stay in their homes. Pilgrim House currently has a member on the CSC board. For more information on the CSC, their website is http://www.communitysupportcenter.org. PH also has participated in the local Social Concerns Network meetings and participates in the Social Concerns Network winter clothing drive in the fall. Pilgrim House participates in the annual HopeFest (formerly know as Walk for Hope) for Alexandra House (shelter for victims of domestic violence) at Bunker Hills Regional park in Andover. Children and Youth Religious Education, Children and Youth, frequently does social action activities with the children. They have been working with 'Alexandra House shelter http://www.alexandrahouse.org/'. The Welcoming Congregation Committee, Welcoming Congregation page, works on GLBT issues at PH. At the Annual Meeting on June 1, 2008, PH voted to become a Welcoming Congregation. PH has marched in the Pride Parade since 2007. Please join us for this year’s parade! 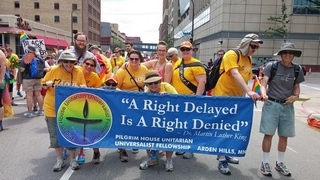 The Minnesota UU Social Justice Alliance http://www.muusja.org/ coordinates regional social justice activities such as UU participation in the Pride Celebration. The UUA Social Justice http://www.uua.org/socialjustice lists major nationwide social action events. In the past Pilgrim House members have been active in Fare Share, Family to Family Ties, and Habitat for Humanity.